Q.K. Cold Stores Ltd, located in Waterford, provides temperature controlled storage to the food industry, ranging from deep frozen to chilled. There are two other facilities in Ireland and one in the UK. The Waterford facility has a storage capacity of 20,000 tonnes, with an average stock rotation of between 3 and 12 months. 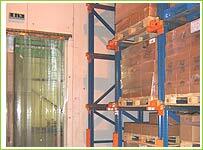 The company provides storage for a number of leading food-based manufacturers. Problem:	The company had previous operated using steel box pallets for storage, but due to increasing demand for its services, decided to adopt a more efficient and accessible storage system. 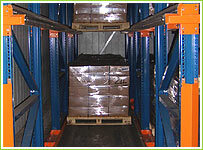 Solution:	Euromech designed, supplied and installed two separate racking systems: a)	Adjustable Pallet Racking for use within its deep-frozen (-20°) storage facility. b)	Drive-In Racking for use in its chilled storage facility (+6°). The Drive-In system provided Q.K. 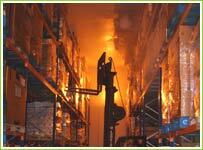 Cold Stores with a total of 1100 new pallet spaces, with each bay of racking 8 pallets deep.